Vertical Contract Manufacturing specializes in manufacturing custom wire and cable harnesses and box build assemblies for the Military and Aerospace markets. Our 65,000 square foot facility is AS9100 certified and ITAR registered, and full FAR process for each order. VCM is high mix facility and manufacturers wire harness assemblies through our state of the art tooling, wire processing equipment, and dedicated assembly processing space. Volume production is not the only VCM benefit, our product is pull-force and crimp height inspected, and 100% of product is electrical tested and inspected at all points with HiPot availability on request. We understand Military and Aerospace market needs and unique necessities; bring us your most challenging projects and we will sort the solution. We specialize in MIL-C-38999, MIL-C-5015, and Arinc connectors. Vertical Contract Manufacturing provides unique capability to service medical markets with our ISO 13485 / ISO 9000 certified 65,000 square foot facility. Our 65,000 state of the are facility has the dedicated space to be able to fulfill medical market project needs on a tight schedule while adhering to the demands and requirements of medical markets; we are UL ZPFW@/ZPFW8 registered, and follow IPC 620B class 3 standards. VCM offers 100% testing and HiPot availability upon request. We understand medical market wire harness and connection needs and specialize in Lemo, TE, Molex, Amphenol, Hirose, JST, Fischer, Harting, and Coaxial connectors. Vertical Contract Manufacturing ISO 9000 certified facility is the ideal source for Industrial and Commercial wire harness assembly needs. Our 65,000 square foot design and production facility has the space and talent available to satisfy the quick turn requirements of industrial and commercial markets. Speed of turn on order does not sacrifice quality at VCM, we follow IPC 620B class 3 standards, and are UL ZPFW@/XPFW8 registered. VCM provides 100% testing on our harnesses and wire assemblies and we offer HiPot upon request. 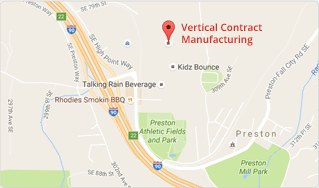 When industrial and commercial customers have a long term or immediate need, Vertical Contract Manufacturing has the facility, tools, knowledge, and logistic support to provide a fast turn prototype and assemblies' as needed.